Bonnaroo Music & Arts Festival celebrates its 18th anniversary later this year, and the list of performers for the 2019 edition has just been announced. 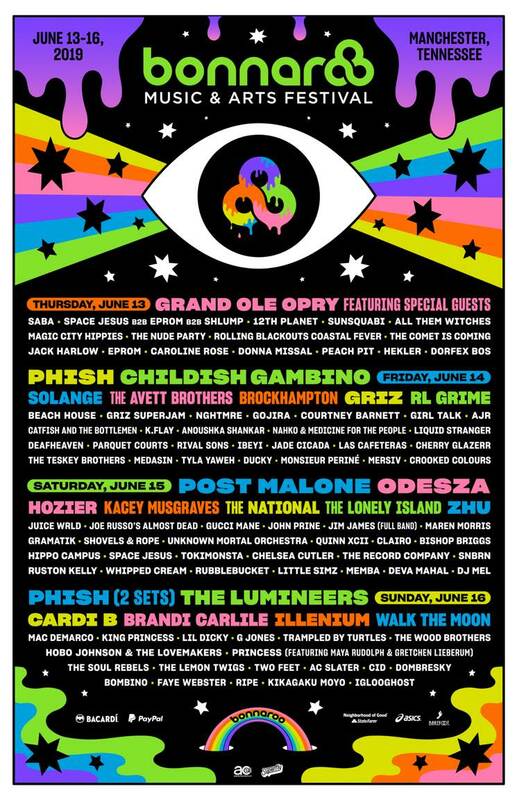 Headliners include the Grand Ole Opry (featuring special guests), Phish (playing multiple sets), Childish Gambino and Post Malone. Other highlights on the bill include Solange, the Avett Brothers, Brockhampton, Beach House, Courtney Barnett, Odesza, Hozier, Kacey Musgraves, the National, the Lonely Island, Zhu, Gucci Mane, Cardi B, Brandi Carlile, Illenium, Walk the Moon, Mac DeMarco and plenty of others. See the full lineup poster above. Bonnaroo will take place in Manchester, TN, from June 13 to 16. Tickets for the festival go on sale this Thursday (January 10) at noon EST. Find full festival details and updates over at the official Bonnaroo website.